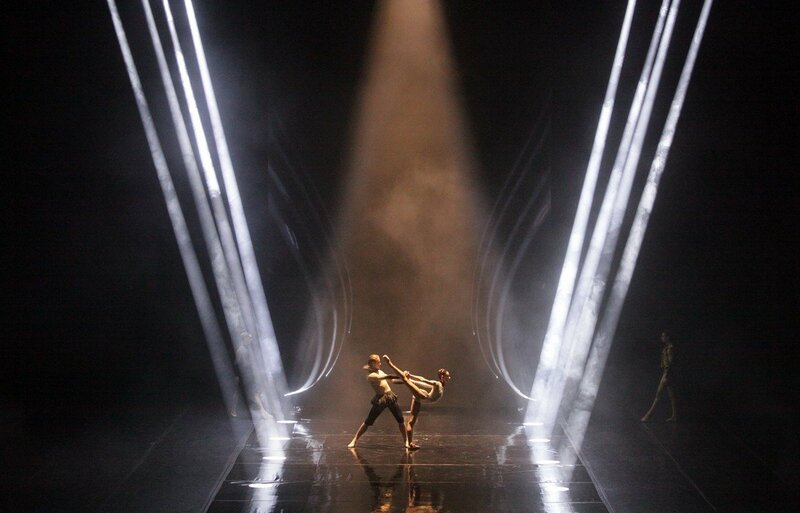 These are the first photos of La Scala’s restaging of Wayne McGregor’s Woolf Works created for The Royal Ballet in 2015. The work was seen again in London in 2017, and in Milan, two of the original interpreters- Alessandra Ferri and Federico Bonelli – reprise their roles. The photos are accompanied by extracts of a 2017 interview by The Royal Ballet with the work’s composer Max Richter. The music for the Mrs Dalloway section of the ballet, entitled ‘I now, I then’, opens with an extraordinary recording of Virginia Woolf herself, reading the essay ‘On Craftsmanship’ in a BBC recording of 1937. How incredible to hear her voice. It’s actually Virginia Woolf! Next comes a multi-layered and elusive web of music that prefigures all that is to come: disparate rhythmic and melodic strands, pulsations, electronic atmospheres, found sounds and field recordings populate the aural space as our focus is shifted by the continuously unstable metrical scheme. The music shimmers as Clarissa Dalloway hurries through it. After the opening material, the act focusses on three central characters in this remarkable novel: namely, those of Peter, Sally and Septimus. The ‘Peter’ music and the ‘Sally’ music are related, since both characters are, for Clarissa Dalloway, people with whom she had a strong connection in the past – roads not taken on her journey through life… The music for Septimus, the shell-shocked war veteran, is a mini de profundis, built around the typically English device of a ground bass, over which the cello solo unfolds, starting at the bottom of the instrument, and ascending to a space beyond our sight. Throughout the act we hear the city of London, represented by a field recording of Big Ben, a sound Virginia Woolf would have heard every day. I always felt that the city itself is an important voice in the novel… so the streets of London accommodate the trajectories of Clarissa Dalloway and her friends. ‘Becomings’, which forms the second part of the ballet, is based on Woolf’s Orlando, a novel of transformations, stretching across many locations and historical episodes. I immediately started to think about the similarities with variation form – the musical process where a recognizable theme is transformed and re-ordered to reveal new aspects of its character – so I chose this process of variation as the basis of the Orlando music. The theme I chose for these variations is the well-known fragment La Folia, which has been used by numerous composers since the middle of the 17th century… However, I wanted the palette to be one which could only exist today; so in addition to variations for the whole orchestra, for solo instruments and for chamber groupings, there are also variations which are wholly electronic, incorporating analogue modular synthesis, sequencing, digital signal processing and computer-generated synthesis. 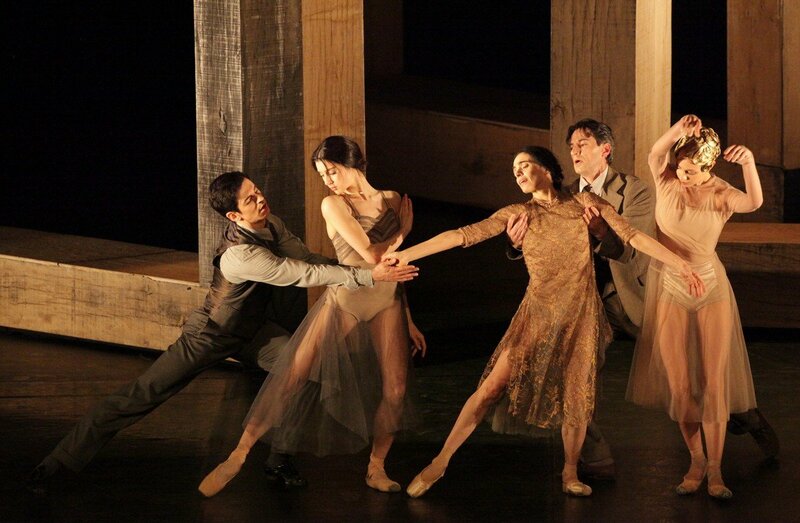 with Alessandra Ferri, Federico Bonelli, Virna Toppi and the Teatro alla Scala Ballet Company. ‘Tuesday’, the third act of the ballet, is a journey through Woolf’s dream-like novel The Waves, and is prefaced by a reading by Gillian Anderson of her last piece of writing, her profoundly moving suicide note. This ‘theme’ of suicide connects to the Septimus episode in Act I, and so I wrote music that relates to that material, in that it is once again structured around a ground bass. The wave-like melodic contours in the music build over 20 minutes and incorporate a solo soprano, as if she were a solitary submerged figure in the oceanic orchestral texture. What a brilliant, creative human being Virginia Woolf was. It’s been extraordinary once again to have the chance to be engaged in the matters that troubled her, the questions she wrestled with and the visionary quality of the answers she discovered.